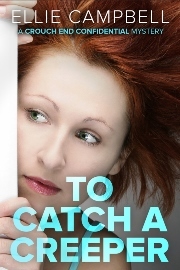 To Catch a Creeper is a funny entertaining rollercoaster ride about a North London wife and mother who once again finds herself involved in solving a murder, while surmounting marital crises, career crises, friendship crises and everyday parental challenges. Cathy is riding high in her brand-new job at a (surprisingly bitchy) top London advertising agency working with best friend Rosa. But when Rosa's pregnancy goes amiss and enemies sabotage her new career, she finds herself leading a chaotic double life of lies and deception, hiding a shameful secret from all, especially husband Declan who appears in the throes of a nervous breakdown. Meanwhile she's agreed to unmask the notorious Crouch End Creeper, a burglar terrorizing their neighborhood. Little does she know that her meddling, assisted by fellow mothers (the Wednesday Once Weeklies) and the Neighborhood Watch, will lead their dangerous opponent to murder. 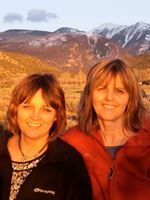 Ellie Campbell is a pseudonym for sisters, Pam Burks and Lorraine Campbell who collaborate across the mighty Atlantic from their respective homes in Surrey, England and Colorado, USA, finding writing together a great excuse for endless phone conversations. Together they have written three previous novels How To Survive Your Sisters, When Good Friends Go Bad and Looking For La La. They love any chance to connect with their readers.